In the eighteenth century, growers planted peach trees very susceptible to powdery mildew in the heart of their vineyards of the Monts du Lyonnais. Their goal? To protect the orchards against the attacks of fungus. In the 80s, René CAILLET MONTEUX-detects the potential of the vine peach. In addition, he marries it to the nectarine to obtain a product that corresponds to contemporary taste. 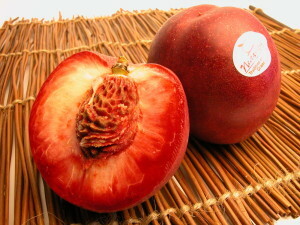 Thus was born the range of Sanguines® varieties of peaches and nectarines. 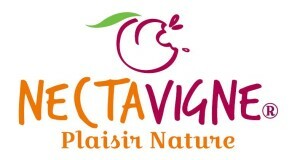 First the breeder and then Star Fruits offer Nectavigne® before declining the product with Pêchevigne® . We know there are over 300 varieties of peaches and nectarines grown in French orchards (40% of white flesh, 60% with yellow flesh). In recent years, significant efforts have been made with regards to variety: aromas, flavors, sugar content, acidity, selection (particularly with regard to the flavor, color and maturity period). The Nectavigne® is an original creation that combines the typical characteristics of a rustic and traditional fruit with the beautiful volume and the smoothness of skin of the nectarine. It has a characteristic red flesh which is juicy, tart, very sweet and very aromatic. A new segment has since been added to the process. Echoing the original fruit, project stakeholders wished to offer consumers the original vine peach. 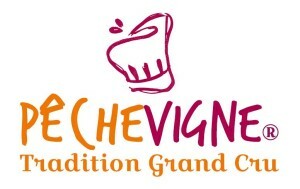 Thus was born PêcheVigne®. Traditional by nature, it is a noble fruit, surprising, subtle, both tangy and sweet. It also has a slight bitterness to the delight of a connoisseur’s palate. The fragrance is original and slightly musky. 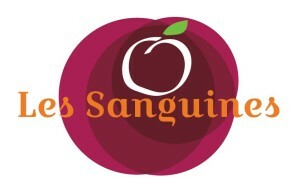 Now Nectavigne® and PêcheVigne® are two segments associated to the same concept: The Sanguines®. In addition to the legal protection of plant material, Star Fruits multiplied the test sites and enhanced the new cultivars assessment procedures. Its purpose is to select varieties with the greatest potential, but also to enrich and to expand the range with new and additional varieties. A selective distribution network was built with Star Fruit, authorized distributors and local producer organizations SICOLY and GIE Tain and Lorifruit. These producer organizations are grouped in Fruit Union , GIE Tain Lorifruit and are also members of the AC Fruits consortium. Initially confined to their original zones, the Sanguines production area has now expanded across the Rhone Valley, and also creates a craze all the way to Emilia-Romagna in Italy. Star Fruit is heavily involved in branding : Coordinating the development and implementation of brand strategy, compliance with specifications, brand promotion, etc.